It can often be difficult to express memories associated with a terrible experience. Art therapy gives people a unique way to cope with their feelings. Sanctuary for Families is a nonprofit group that helps clients who've experienced some form of domestic or gender-based violence. Sanctuary's Director of Children and Youth Services Pamela Krasner describes how this affects her clients. "They've all witnessed or experienced domestic violence, so what that means is often times, they've seen one parent physically assault the other," Krasner said. "We've had clients who've actually witnessed homicides, with one parent killing the other." 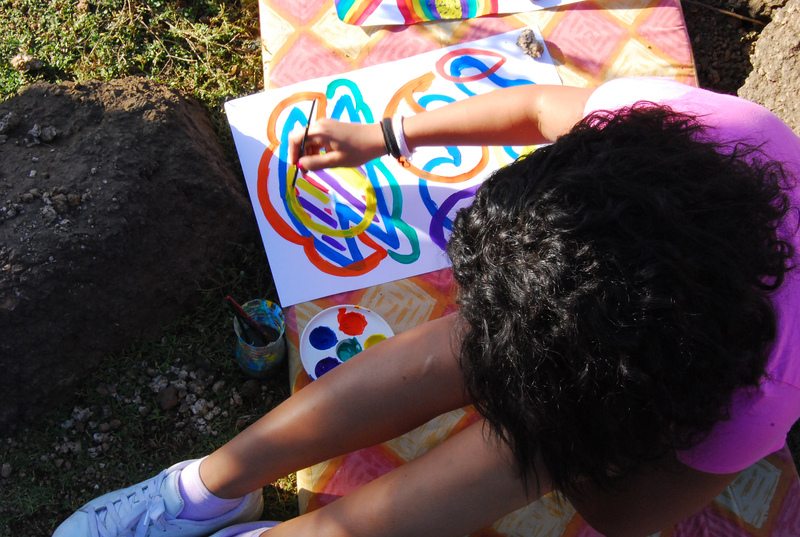 One way Sanctuary for Families helps its clients is through art therapy. Licensed Creative Arts Therapist and supervisor of the program Mikella Millen says art therapy provides an outlet for clients to address painful experiences without necessarily having to talk about them. "I think that one of the biggest misconceptions about art therapy is that the art is used to diagnose people," Millen said. Millen says the actual process of creating the art helps the clients. "Really, it's the client that's doing the interpreting of their own work, that's reflecting upon their own work," Millen said. Millen says the concept of art having therapeutic benefits is nothing new. "Art has been a mode of expression since the beginning of human civilization," Millen said. "The oldest records that we have of human existence involve using art to express yourself, to tell your story." Director of Children and Youth Services Pamela Krasner sometimes uses art in her therapy sessions as well. She recalls a four year-old client who witnessed his father physically attack his mother. "He wasn't really able to tell me because it's so traumatizing, that in order to kind of share it again, it's like you sometimes feel like you have to relive it again, and you don't want to talk about it," Krasner said. Krasner says they finally made progress after the client drew a picture. "I was able to actually get a really vivid picture of what had happened from a four year-old who really had a difficult time expressing it verbally," Krasner said. Krasner explains the unique benefits of art therapy. "Talk therapy is really an amazing thing, and it works for a lot of people and for a lot of clients," Krasner said. "And I do think that art therapy is a modality that's in a place of its own, in a way where it can help younger children, older children and adults that are having a really difficult time express themselves. Express themselves, and process through something really difficult in a different way." Program supervisor Mikella Millen says the increased participation in art therapy sessions speaks to its larger appeal. "Art therapy is something that, I think, bypasses some of the stigma associated with receiving any kind of mental health treatment," Millen said. "It allows for some degree of privacy to be maintained on a personal level, meaning that you can express something through your artwork without necessarily explaining what it means." Sanctuary for Families uses art therapy in both individual and multi-family group sessions.